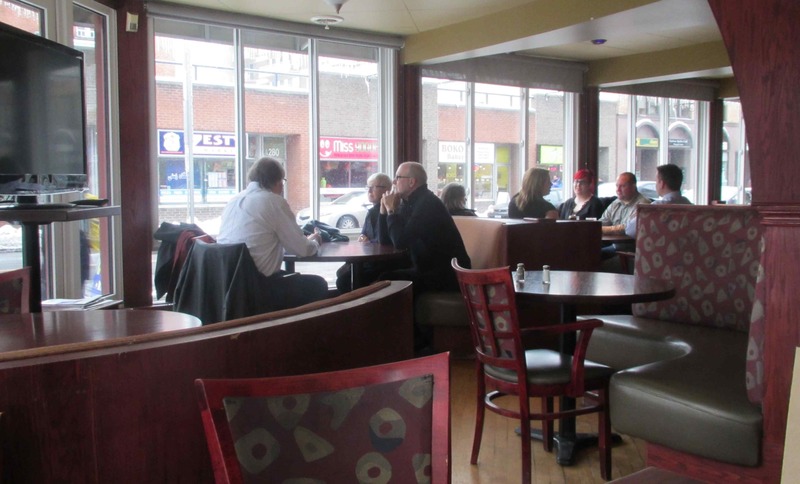 The pub is spread out over three floors with a party room on the third, a nice lounge style area on the second (with an outdoor patio available in the summer) and a more restaurant-style area on the bottom level. The second floor seems much as I remember it but the ground floor (shown above) seems to have changed considerably. It is split into two sections, with a small bar on one side and then a glassed in area on the other, as shown above. It is nice, comfortable and a pleasantly bright place for lunch. The service during my stay was not terribly good as there was only one waitress covering both ground floor areas and she tended to disappear for long periods. She was pleasant enough but obviously too busy to be very attentive. Normally, I might blame the management for this but I heard her mention to people at a table nearby that a colleague had failed to turn up for her shift. 10oz. 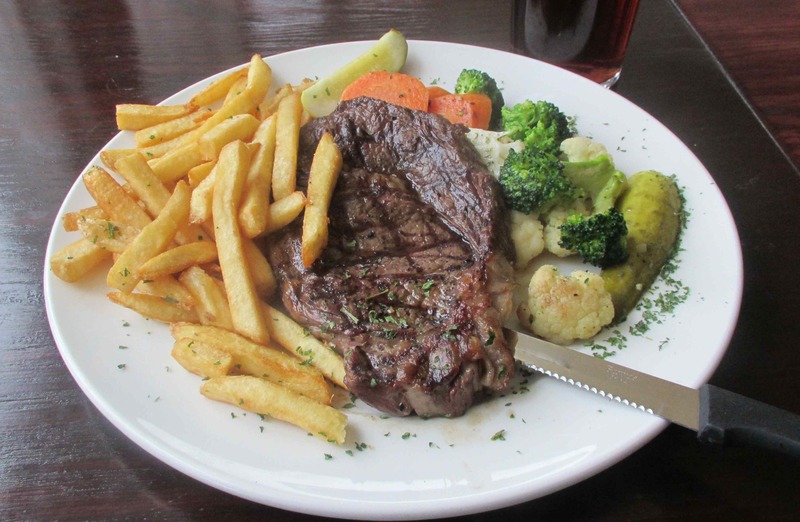 Rib-eye – I keep telling myself that I should never order steak except at a steakhouse as I am so frequently disappointed. On this occasion, however, my gamble paid off. The special (at only $15.95) came with soup, or salad, and allowed for all sorts of substitutions and additions including shrimp and mushrooms. I wasn’t especially ravenous so I waived the first course and just chose fries, without anything else except the included veggies. The veggies, I was pleased to note were fresh not frozen, and consisted of broccoli, carrots and cauliflower, all lightly seasoned and sautéed with butter. The steak itself , to my pleasant surprise, was a nice, well marbled cut and perfectly cooked to my required medium rare. It was deftly seasoned, juicy, and very flavorful. I think the entire presentation rated a 4 out of 5. 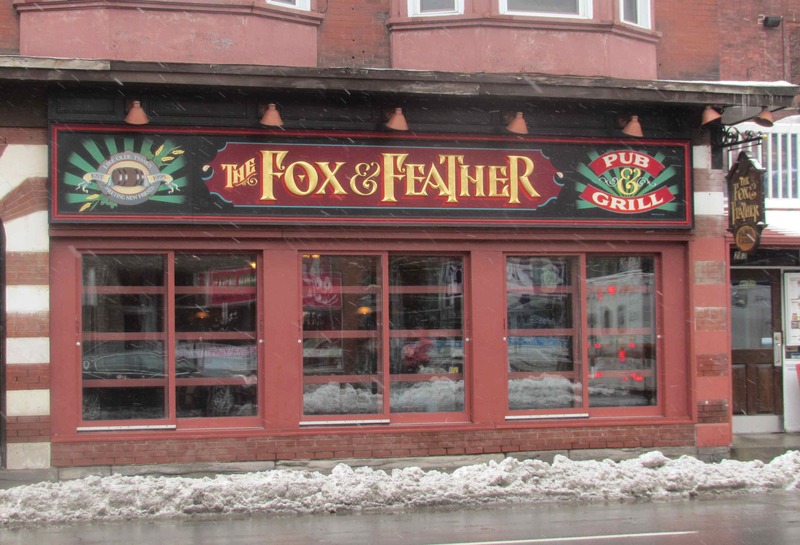 The Fox and Feather is a pleasant enough place that does a pretty good job for the class of establishment it represents. Maybe a little bit more quality control on the service is in order but, on the whole, I enjoyed myself and would be happy to return for a simple meal or just a drink or two. For my experience on this occasion I would rate it at a 3 out of 5.